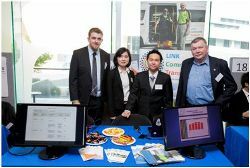 We’ve been running our full-year industry experience (IE) projects for students since the 1970s. They’re designed to prepare students for a smooth transition to the workforce, and our students consistently rate their IE project as the highlight of their course. Usually run over two semesters, IE projects give you the chance to apply the knowledge and skills you’ve gained throughout your degree. At the same time you’ll research and develop new skills, all while you design, develop and deliver an information system for a real-world client. Along the way you’ll experience the ambiguity and complexity that comes with developing and delivering IT solutions. At every stage, you’ll continue to have the support of the university environment, with academic supervisors mentoring and overseeing your progress throughout. a capacity to deal ethically and competently with people from diverse cultures and backgrounds. At the same time, you’ll transition to being an independent learner, which is essential in the IT profession. Got some questions about the IE project, how it works, and how it fits into your course?